Dan on Ama Dablam, the world's most famous snow, rock & ice climb. Photo Duane Morrison. David O`Brien at the Summit of Everest from Tibet. Dani Fuller at camp 1 AmaDablam. Welcome to our 18th year of affordable, participation-oriented approaches to climbing the Himalaya. Thanks to the enthusiasm of many past and present members like you, our company is made-up of the efforts of our members, leaders, staff, and the organizations who join our ranks: Blue-Sheep-Travel, Parivar-Treks, Himalaya-Incorporated, Himalayan-Expeditions, and SummitClimb.com . All of our current expedition leaders began their career in our leader-in-training programme. Are you interested in becoming a leader? If so, then would you please visit our new Leaders-In-Training Website . Please click one of tab below to view that leader's biography information. Daniel has been active in climbing the highest peaks of the Himalaya for many years. His personal link with the region and its peoples began when he traveled and trekked throughout Tibet and Nepal with friends, then joined together with Anatoli Boukreev and friends to ascend Mount Everest followed by 7 of the world's highest 8000 metre peaks, including Everest Tibet , Everest Tibet Training Climb , K2, Lhotse, Makalu, Cho Oyu, Shishapangma, Everest Tibet Basecamp Trek and Gasherbrum 1. He has been leading and organizing successful and safe overland, trekking, and mountaineering expeditions for 18 years, to Tibet, Nepal, Tadjikistan, Pakistan, India, China, Africa, and North America. Daniel Lee Mazur was born in Illinois. His family came from Zlotow, Poland, and Bristol, England. As a boy he spent his summers exploring the wilderness waterways of Canada by canoe with a YMCA group. He was an active Boy Scout for many years and was taught to ski by his father Robert. At age 12 his mother Mary started bringing Chinese students home to live in the house, so he learned his first words of Chinese around the dinner table and while doing chores. He first tasted the high peaks at age 17, while a student at the University of Montana, climbing Gunsight Peak and the Sperry Glacier in Glacier National Park. Photo right: Dan in Mustagata basecamp (Manuel Weber). 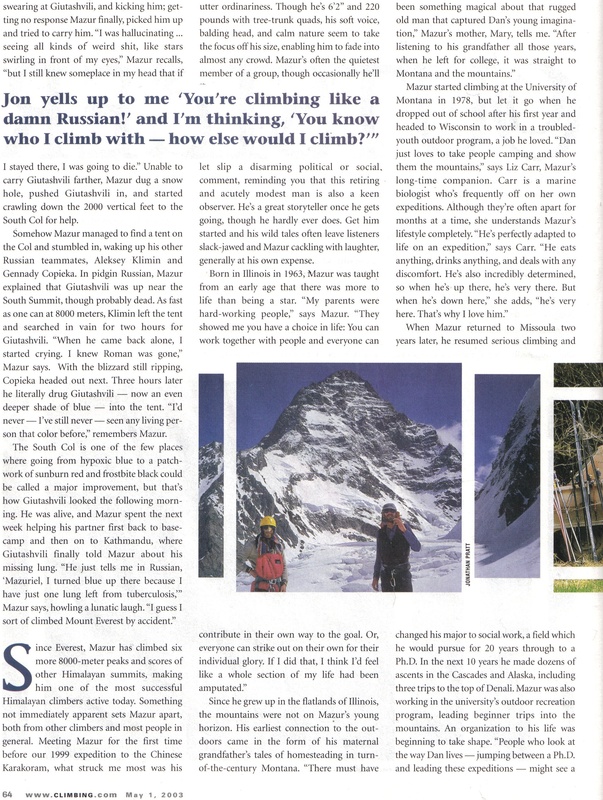 Dan learned to climb in the Himalaya on a commercially organized expedition, where they attempted to climb the 3 highest mountains in the then Soviet Pamirs, and did succeed in climbing one peak: 7105 metre high Korjenevskaya. When he is not climbing Everest and Himalayan Peaks, or travelling the world giving slideshows to raise money for charities such as www.MountEverestFoundation.org , he lives in Bristol, England, and Olympia, Washington. 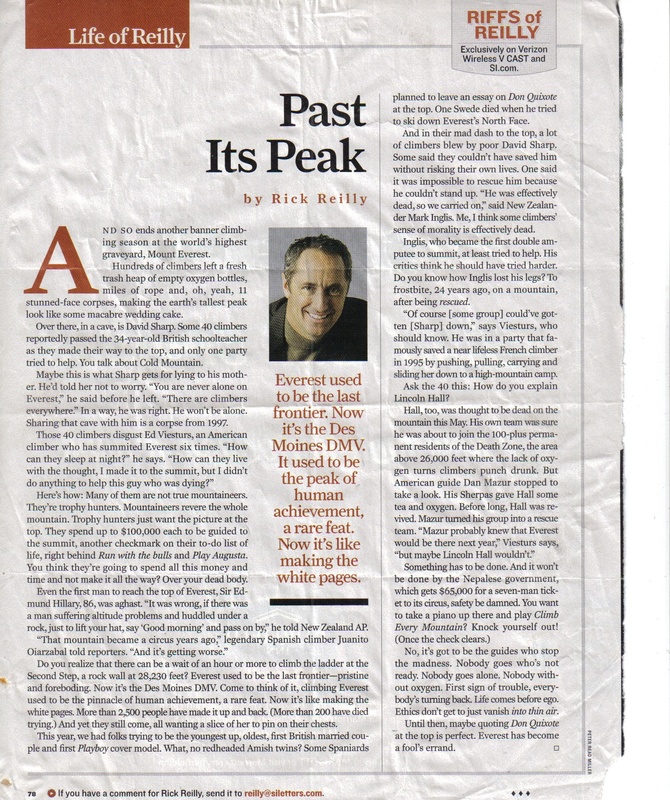 He is a member of the Alpine Club, a fellow of the Royal Geographical Society, a member of the American Alpine Club, a fellow of the Explorers Club, a member of the Mountaineers Club, holds a certification in Diesel Mechanics, and a PhD in Social Policy Analysis from the Heller School at Brandeis University. Dan has lived in England, Asia, and North America, but spends more and more of his time lecturing and raising funds for the Mount Everest Foundation for Sustainable Development in Nepal and Tibet, building hospitals, schools, and environmental projects with the low-income families who live around Mt. Everest, in both Nepal and Tibet. 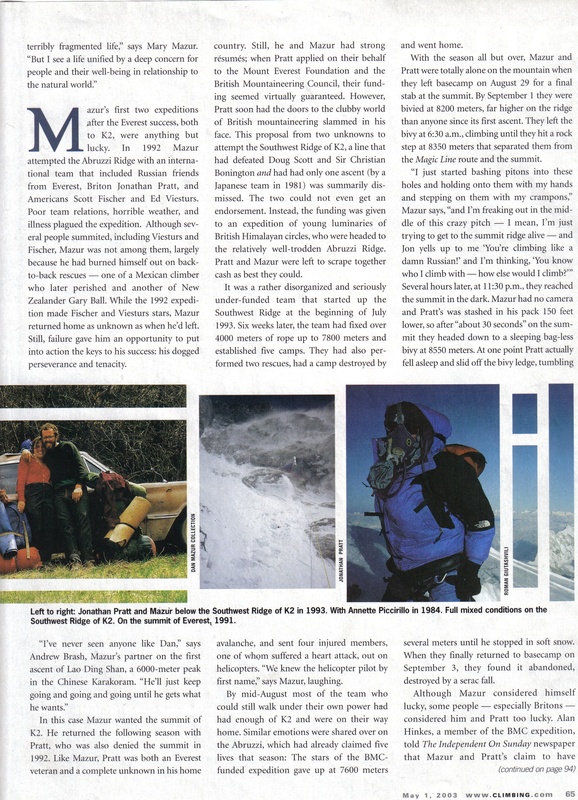 In 1993, ‘Climbing’ Magazine named Dan the "most successful to ever launch an expedition". As an articulate but humble Himalayan explorer and scholar, he has been active in climbing the highest peaks of the Himalaya for many years. His personal link with the region and its peoples began in 1986 when he traveled, trekked, and climbed throughout Tibet and Nepal with friends. Since then, he has been personally leading and organizing successful overland, trekking, and mountaineering expeditions for 18 years. Dan Mazur is most widely known for his discovery and assistance in the rescue of Lincoln Hall, an Australian climber on Mount Everest on 25 May 2006. Lincoln Hall had been 'left for dead' by another expedition team the previous day at around 8700m on Everest after collapsing and failing to respond to treatment on the descent from the summit. 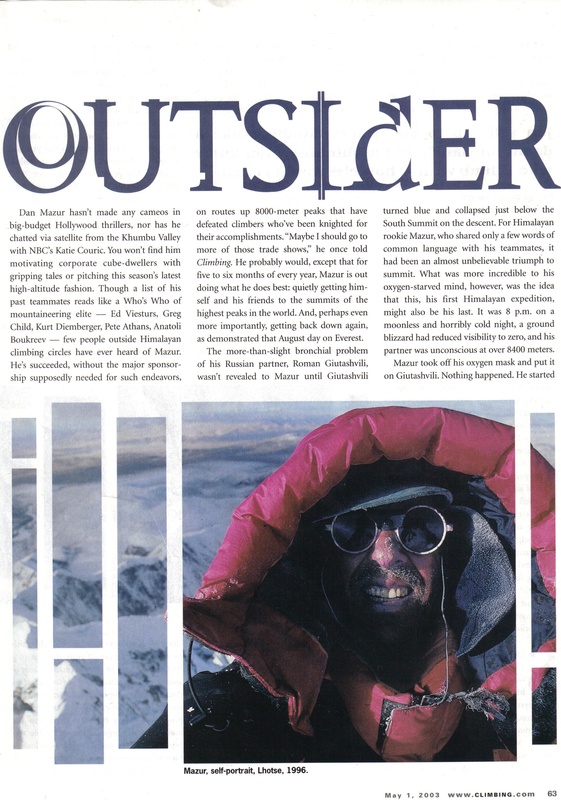 Mazur and his fellow climbers - Andrew Brash (Canada), Myles Osborne (UK) and Jangbu Sherpa (Nepal) - in abandoning their own attempt on the summit in order to save Hall's life epitomised the noblest traditions of mountaineering. Their sacrifice was underscored by the death of a British climber; David Sharp, who died a few days before Hall, lower down on the same route. Approximately 40 people said they saw Mr. Sharp in distress, and walked past him, but no one rescued David Sharp, and he subsequently died. Sir Edmund Hillary, who made the first ascent of Everest in 1953 with Tenzing Norgay Sherpa, spoke out against those 40 people, and said that nothing like that would have happened in his day. For more photos and story of Dan's first Everest climb, please read the news articles below or click here to learn more about Dan. Dan's written, photographic, and cinematic works are featured in London Alpine Journal, American Alpine Journal, Ito-Yuki Journal of the Japanese Alpine Club, Himalayan Journal, High Magazine, Climbing Magazine, Climber Magazine, the London Independent Newspaper, the London Guardian, On the Edge Magazine, Outside Magazine, Rock and Ice Magazine, Vertical Magazine, NBC Television, The Discovery Channel, EverestNews Website, Quokka Sports Website, and the Mountainzone Website. Dan is a Fellow of the Royal Geographical Society, a member of the Alpine Club, and The Mountaineers. To read more about the exploits of Dan and friends, please visit our "News" and "Archive" pages. CONTACT DAN MAZUR: send an email to info@SummitClimb.com with Dan Mazur's name in the subject line and we will gladly pass your question or comment directly to him. "Climber: Choice of Summit or saving a life an easy one"
"Rescue From the Death Zone"
"Mt. 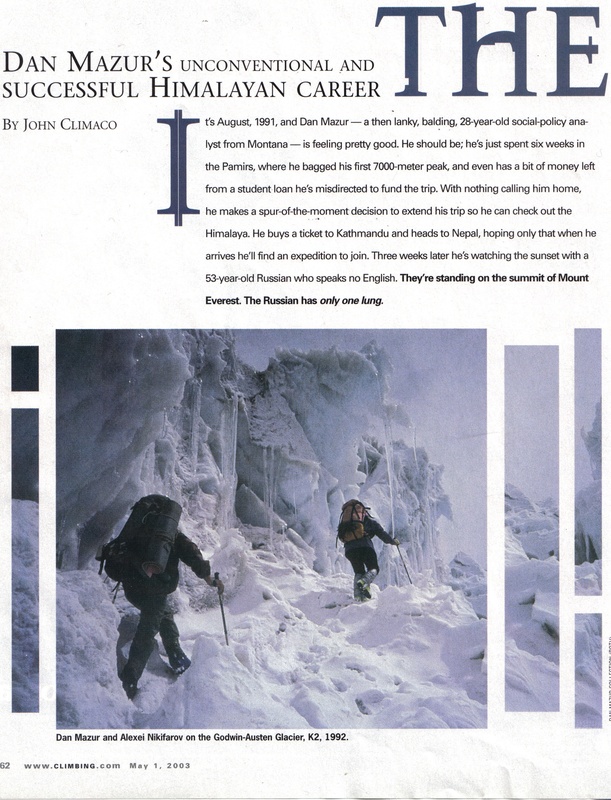 Everest Rescue, Saving A Stranger Left for Dead"
"Olympia guide helped save life of Everest Climber left for dead"
"Dan Mazur's Unconventional and Successful Himalayan Career"
During your full-service expedition, you will benefit from the leadership provided by David O'Brien. 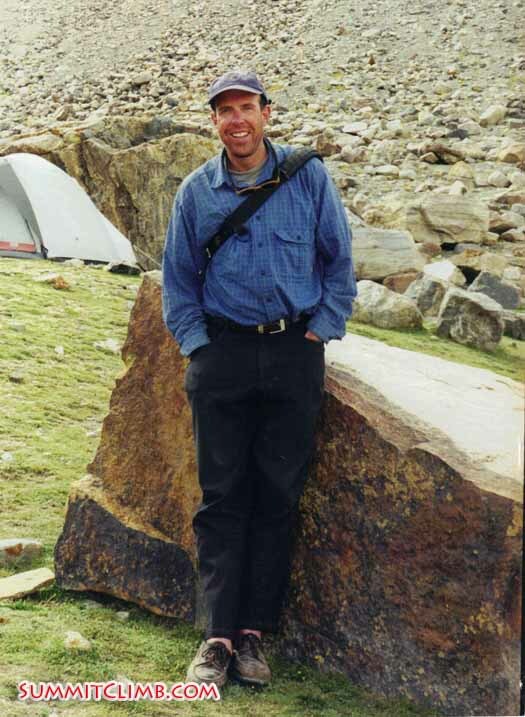 David has climbed in the Indian and Nepalese Himalayas as well as in the Alps. He has led expeditions in the high arctic island of Spitsbergen and has a liking for the cold and remote having crossed Greenland by ski. He has organised and led overland trips in Asia and North Africa. David has been climbing and working with Summit Climb since 2006 and is a thoughtful, considerate leader. He is back on Everest for the seventh time this year having summited Five times. He is a Fellow of the Royal Geographical Society and lives in the UK with his partner and children. Felix, a proficient technical climber, a graduated mathematician and financial analyst, who lives in Zürich, Switzerland, and Berlin, Germany, is a full-time climber living of slide shows, guiding and leading expeditions. He has lived in Nairobi, Kenya, in 2002-2003 and since is our Africa expedition organizer, has successfully lead 6 Kilimanjaro and 10 Mount Kenya ascents and organized even more. He is fluent in Swahili, and has been involved in training the Kenyan Wildlife Service (KWS) mountain rescue team on Mount Kenya since 2004. Felix was the co-leader of our 2002 Kangchenjunga expedition and Everest-Tibet 2004. He is a very well organised person, and a strong climber, with good ideas, always eager to help others. He has made solo winter ascents of major North Face Routes in the Alps. Felix met SummitClimb, when he made an impressive no-rope ascent and descent of Ama Dablam with a German-Japanese expedition in 2001, then became a leader in training on Kangchenjunga and improved his leadership skills on Everest-Tibet 2004. Felix has his own website you might enjoy visiting: www.BergBote.de . Please be sure to return here when you are done. Thanks. Felix recently completed a record breaking speed Ascent of Mount Kenya´s Nelion (5189 metres) in 56 minutes and Batian (5199 metres) in 1 hour 17 minutes. Please click here to read more . CONTACT FELIX BERG: send an email to info@SummitClimb.com with Felix Berg's name in the subject line and we will gladly pass your question or comment directly to him. Photo: Felix in the Forests of Mount Kenya, where he is currently a mathematics student. During your full-service expedition, you will benefit from the leadership provided by Max Kausch, fluent English, Spanish, and Portuguese speaker, Aconcagua , Everest View Glacier School , Cho Oyu , Lhotse , and Ama Dablam leader, as well as trek leader for Everest basecamp Nepal and Cho Oyu advanced basecamp , and technical expert. He is a relaxed, considerate and thoughtful person; an expert leader and a highly-skilled professional who specializes in getting people to the summit and back down in 100 percent safety. Max was born in Cordoba, Argentina and has lived in the UK and Brazil, where he has climbed all over the Andes, Alps, Pamirs and Himalayas. He is a good communicator, a great motivator, and has a positive attitude. Max is currently studying to become a AAGM-UIAGM guide in Argentina and is a certified WFR and trained rescuer. CONTACT Max Kausch: send an email to info@SummitClimb.com with Max Kausch's name in the subject line and we will gladly pass your question or comment directly to him. Rob is an experienced mountaineer having climbed in Alaska, the Alps, and the Himalayas. Rob lives in Ireland when not on an expedition and works as a chartered tax advisor / chartered accountant. Rob places his main focus on having a well organised, safe and prepared team, and has extensive experience climbing with teams on Himalayan expeditions, including Ama Dablam summit and Everest summit. Rob will always seek to ensure that all team members feel included and prepared for the fun challenges that await during their time with SummitClimb. CONTACT Rob Mortell: send an email to info@SummitClimb.com with Rob's name in the subject line and we will gladly pass your question or comment directly to him. Mingma holding up a copy of the Sherpa Adventure Gear catalogue where he is featured on the cover. Mingma is 32 and from Namche Bazaar, the capital of the Sherpa people. He went to the famous Hillary School in Khumjung. Mingma's parents still live in a tiny house in Namche and his father was also a trekking guide, so taking care of visitors to the Khumbu Valley is in his blood. Mingma worked for five years in the famous Italian research pyramid at Lobuche. He speaks fluent English, Sherpa, and Nepali, and knows every rock, building, and wild animal along the Khumbu trail. He is sponsored by sherpa adventure gear. CONTACT MINGMA SHERPA: send an email to info@SummitClimb.com with Mingma Sherpa's name in the subject line and we will gladly pass your question or comment directly to him. Mingma leading our May Everest Basecamp Trek through Pheriche (Mike Martin). Yangjie is 26 and from Tara Koshi in the Khmbu Valley. She went to high school at the famous Hillary School in Chauri Kharka. Her father is the famous climbing sherpa and sirdar Pasang Temba. Yangjie grew up in a climbing family and always heard stories of daily adventures of climbing the high peaks even as a toddler. She enjoys meeting new people and helping them discover the Khumbu Valley she calls home. Yangjie speaks fluent English, Sherpa and Nepali. She is sponsored by sherpa adventure gear. CONTACT YANGJIE SHERPA: send an email to info@SummitClimb.com with Yangjie Sherpa's name in the subject line and we will gladly pass your question or comment directly to him. Doug Sandok has been leading expeditions, guiding, and instructing in mountains all over the world for over 15 years. Doug has worked for SummitClimb on Ama Dablam, Kilimanjaro and Mt Kenya, as well as for other companies such as Outward Bound and Where There Be Dragons in the Himalayas, Patagonia, Africa, Mexico, Alaska, Colorado, California and Oregon. He has lived in many countries, and travelled and climbed extensively in remote regions of the world. Doug is not only a highly skilled technical climber, he is a real gentleman, with a friendly, diplomatic attitude, and a sense of caring for all of our team members, staff, and the people and cultures we encounter along the way during our expeditions. He has a great interest in foreign languages with a solid working knowledge of Nepalese, French and Spanish. CONTACT DOUG SANDOK: send an email to info@SummitClimb.com with Doug Sandok's name in the subject line and we will gladly pass your question or comment directly to him. Susan Purvis’s love for adventure leads her around the globe.Susan is a Wilderness Emergency Technician, Cultural &Spiritual Guide, Geologist and K-9 search and rescue expert. Susan founded Crested Butte Outdoors International, an educationalcompany that teaches courses in wilderness medicine, eco-tourism, survival and avalanche search and rescuesince 1997. Recently, Susan traveled to the ‘hottest’, the ‘coldest’, and ‘highest’ place on earth; Ethiopia, Antarctica and Nepal as an expert in wilderness medicine. Her work as Presenterin Ethiopia for ascience documentary, “The Hottest Place on Earth,” aired on the Discovery Channel and the BBC in 2009. Susan trains African’s and Sherpa guides about high altitude medicine in their homelands. Her program, Wilderness Medicine as a Second Language is so successful she started a non-profit school in the Mt. Everest region of Nepal. Log onto www.cboutdoors.com for more information. As a former gold exploration geologist in Latin America, Susan traded her rock hammer for a chance to work ski area medicine and train an avalanche dog. Since 1995, Susan and her dog Tasha have saved lives through education and by deploying to over 65 search and rescue missions in the high country of Colorado. They’ve found victims buried under avalanche debris, drowned in high alpine lakes, and lost in the wilderness. Their success brought them US congressional recognition and made them the team to call when someone’s life is on the line. Susan now calls Whitefish, Montana home yet travels the world educating and training outdoor enthusiast about what she loves most. She is working on her memoir, Searching for Life. 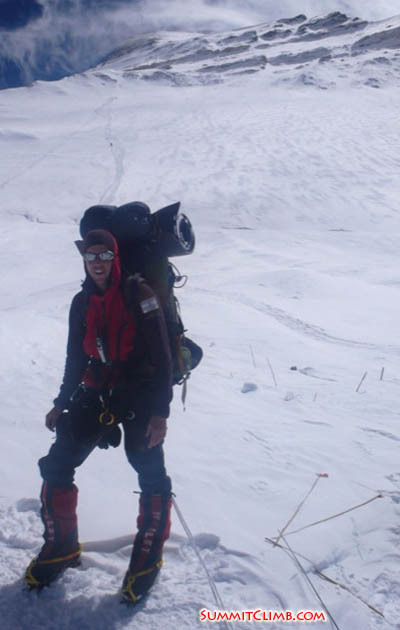 Angel Armesto has been leading our Cho Oyu expeditions and Aconcagua climbs for several years. He is originally from Argentina and is a very friendly and experienced leader. He speaks English and Spanish, and is very helpful to all of our members and works well with the Sherpas. You will enjoy climbing with Angel. Don has been climbing for nearly two decades. He has lead trips throughout the United States/Alaska, Canada, Costa Rica, New Zealand, Mexico, Chile, Argentina, and Nepal. His notable climbs include: Aconcagua, Mera Peak, Baruntse, Island Peak, AmaDablam, La Malinche, Iztaccihuatl, Mt. Rainier, Denali, and many more. At work, Don is known for being hardworking, respectful, patient, and calm under pressure. He is one of only a handful of people to have climbed icebergs floating in the ocean and climbed with a dog that set a world record for the highest elevation that a K-9 has ever climbed. When he isn’t on a mountain, Don lives in Seattle, Washington and enjoys whitewater rafting, rock climbing, ice climbing, and traveling with his fiancé and rescue dog. He also volunteers for Seattle Mountain Rescue, a high angle search and rescue team. Dani Fuller is a Briton from Hampshire, who also has lived in France and Spain. Since 2009, Dani is an experienced leader of SummitClimb's Manaslu, Cho Oyu, Ama Dablam, Baruntse, Island Peak, and Glacier School expeditions. Dani is very friendly, an excellent teacher and a good friend to all of our members. He is always helpful and kind to others and a very strong climber and well organised leader. We know you will enjoy meeting Dani Fuller and climbing as well as trekking together. She was born in February 1986 in Rochester, New York. By the age of 6, she had her first taste of the mountains: the Swiss Alps, where she witnessed her first avalanche. Since then, Ulyana has traveled to all 7 continents, with experiences ranging from working on the back deck of an icebreaker in Antarctica to climbing Kilimanjaro in Africa. She has climbed over a dozen peaks over 14,000 ft. in Colorado, Washington, Mexico, Tanzania and Nepal. Currently, Ulyana is a PhD candidate at the Cooperative Institute for Research in Environmental Sciences (CIRES) at the University of Colorado Boulder. Her PhD work focuses on the changing state of the Himalayan glaciers, through the use of field instruments and time-lapse photography. She is fluent in English and Ukrainian. Martin Szwed has been a SummitClimb member and leader for many years. He started his first climbs in the Swiss Alps almost 20 years ago, on peaks such as the Matterhorn, Eiger and Weisshorn. Martin has attained the coveted Snow Leopard Award by ascending the five 7,000 metre, 23,000 foot high peaks in the former Soviet Union. Martin has climbed the 7-Summits. 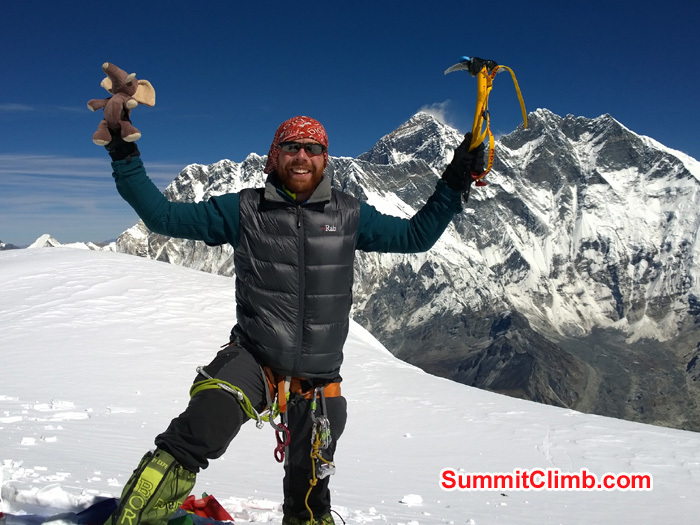 He leads SummitClimb expeditions to Everest, Cho Oyu, Ama Dablam, Baruntse, and Manaslu. During the off season, Martin works as an industrial rope access technician and is a level 3 supervisor with IRATA and FISAT certification. Martin is very friendly, strong, well organized and caring. He is an excellent teacher of technical rock, ice, and mountaineering skills. Martin communicates very well, and is always looking for ways to help SummitClimb members achieve their goals. Martin proposed marriage to his wife Christina while the newlyweds to-be were on the summit of Mount Ama Dablam, and Martin and Christina have gone on to become quite the dynamic duo of Himalayan Climbing and Trekking!